Jasmin Santana is a member of the Cleveland City Council. 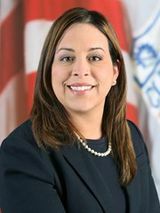 Ward 14 Councilwoman Jasmin Santana was elected in November 2017, becoming the first Latina council member in the city’s history. Councilwoman Santana represents Clark-Fulton, Stockyards and portions of Brooklyn Centre, Tremont and West Boulevard neighborhoods. She serves on four council committees – Health & Human Services; Safety; Transportation and Utilities. She is also council's representative to the city's Community Relations Board. Councilwoman Santana worked as an outreach coordinator with the non-profit Hispanic Alliance, focusing on public safety, lead abatement and various social issues. She also worked for MetroHealth Medical Center, promoting health and nutrition education in the Hispanic community. While at MetroHealth, she helped develop the first grassroots Latina breast cancer education program in Northeast Ohio. Councilwoman Santana has received various public recognitions for her civic activism, including being featured in a 2016 story in Crain’s Cleveland Business magazine. Councilwoman Santana has served as a trustee for a number of non-profit on social service agencies, including the Northeast Ohio Association for Hispanic Health and the May Dugan Community Center. Councilwoman Santana is a graduate of Max Hayes Vocational School. She is currently studying non-profit administration and public health through a dual program with Cuyahoga Community College and Cleveland State University. She lives in the Jones Home Historic Neighborhood with her husband Pirulo Diaz and two teenage children. Cleveland City Councilman Brian Cummins faced a spirited challenge from Jasmin Santana, a longtime ward resident who has been endorsed by the ward's Democratic club and its influential leader, Rick Nagin, who finished second to Cummins in the 2009 election. Santana, 38, earlier this month resigned her job as a community-engagement coordinator for the Hispanic Alliance, an umbrella group for other Hispanic nonprofits. She said she was stepping down to focus on the "campaign and the family," but her opponents had grumbled that her position with the organization had given her unfair access to potential voters. Before the Hispanic Alliance, Santana worked for MetroHealth to recruit minority women to participate in a breast-cancer education, early-detection program there. Santana was born and raised in Ward 14, and lives in the Clark-Fulton neighborhood. She said Cummins has not been responsive to the concerns of residents in the ward, which is one of the city's poorest. "They're frustrated. They're tired with how things are going, and just want something new," she said. Santana's campaign manager was Diane Morgan. There were two main forces backing Santana: the region's Latino leadership and the Ward 14 Democratic Club, represented prominently by Ward Leader Rick Nagin and Ward President Diane Morgan. Molly Nagin with Jasmin Santana.